I’ll take any excuse to quote The Smiths, but don’t let the sort of depressing title fool you : things are going quite well around here. I’ve been away from the blog, but I have two chief accomplishments that I was able to achieve in absence from the internet. One: I finally moved to a house two blocks from Lake Erie in Buffalo, NY, where, unlike Sarah Palin, I can almost literally see Canada from the backyard. 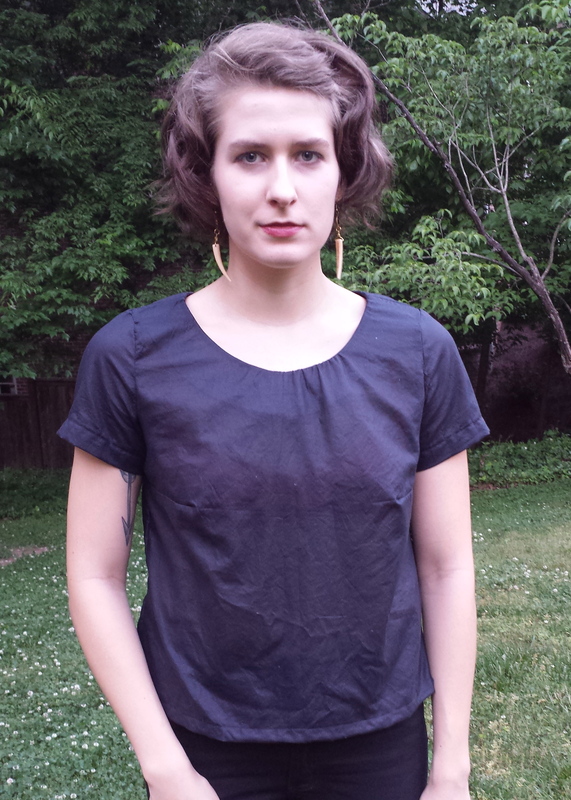 Two: I made the Sinbad & Sailor Dove blouse for Sewing Indie Month. The other day, a friend and I went out to lunch with out mothers, and somehow we all started talking about people who get their colors “done.” It turns out that both our moms had had theirs done, but neither of us had ever really heard of that, and we both thought it was kind of a funny idea. Maybe it’s a generational thing? At any rate, I don’t know if I’m a Fall or Winter or whatnot, but I’m pretty sure no color expert could tell me anything surprising at this point. I look jaundiced in pastels, and generally, the darker the color, the better. Thus, I have a lot of black clothing–and what goes better with black clothing than more black clothing? In fact, my commitment to dark neutrals got to the point where when I was living in Brazil, I had someone tell me that I needed more color in my wardrobe because wearing all black all the time simply isn’t done in Brazil. (That person ended up being right, too: black clothing absorbs summer heat like no other.) I’ve since spiced up my life with the introduction of some jewel tones and vintage silhouettes, but my proto-goth sensibilities will always stay with me. It should come as no surprise, then, that although my stash is small, it already contained a lightweight woven black cotton, perfect for summer shirts. 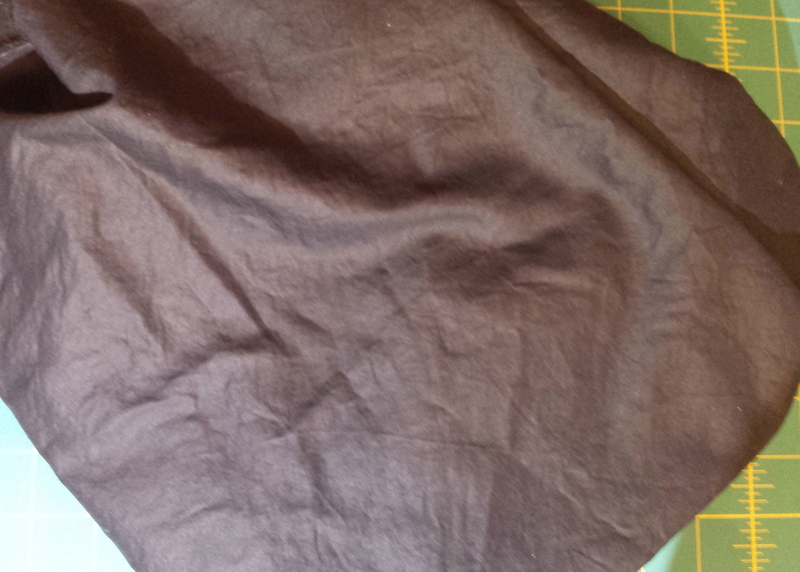 I have no idea what this type of fabric is called, and it wasn’t labeled on the bolt at Gail K. when I bought it, but it has a lovely sheen to it. Printing and putting together the pattern was a breeze, and the instructions were pretty clear. In fact, if I didn’t sew this shirt in bits and snatches between packing for my move, I think it would have come together really quickly. The cotton is a bit delicate, and after my experience with seaming easily-fraying fabric for the chiffon blouse, I decided to use French seams on almost everything this time around. I’m pretty pleased with the results. This was also my first time ever setting in a sleeve, and I’m thrilled with how easily they went in. The only hiccup in the project was that I only had one type of interfacing on hand at the time, and it turns out that it was way too stiff for the neckline. As you can see in my pictures of the finished garment, the interfacing is pretty visible and awkward when I wear the blouse. I’ve since bought new, lighter weight interfacing and I’m going to redo the neckline as soon as I can figure out where I put the leftover black fabric, which seems to have gotten misplaced in the move. All in all, though, I’m pleased as punch with this new addition to my wardrobe. It’s breezy, chic, and can be dressed up or down. For me, this is definitely an Everyday Casual piece, especially since it matches all my other black clothing. This entry was posted in Sewing Projects, Shirts and blouses and tagged black clothes, Gail K. Fabrics, indie patterns, quoting Morrissey, sewing, sewing indie month, Sinbad & Sailor. Bookmark the permalink.